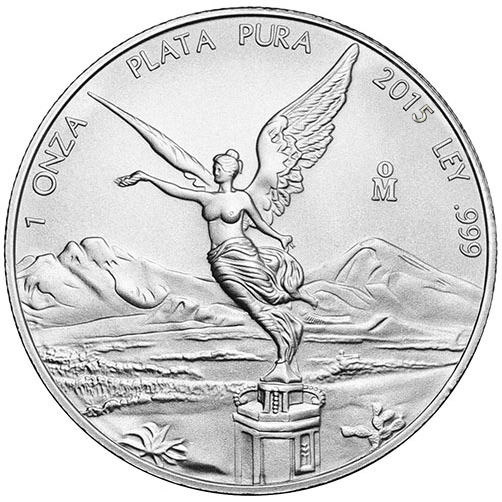 The Mexican Silver Libertad coin is the official silver bullion product of Mexico. 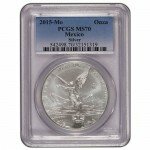 Struck on an annual basis since 1982, the 2015 1 oz Mexican Silver Libertad coin is now available from Silver.com in a 450-coin Monster Bag, allowing you to make a major investment in this high quality silver bullion coin with just one transaction. Each coin consists of one ounce of .999 pure silver. Ships in a mint Monster Bag of 450 coins, with 18 individual tubes holding 25 1 oz coins each. Produced by the Mexican Mint (Banco de Mexico). 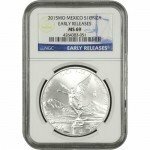 Design sets used on the modern Mexican Silver Libertad coins date back to the nation’s celebration of the centennial of the opening shots in the War of Independence. During the 1920s, the nation looked back on 100 years of independence from Spain, and produced the gold Centenario coin. 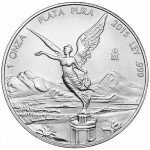 On the obverse face of the 2015 1 oz Mexican Silver Libertad coin is the image of Winged Victory featured on the gold Centenarios. The statue of the angel of independence is set in the middle, with the twin volcanic peaks of Popocatepetl and Iztaccihuatl visible in the background. Engravings include the coin’s metal content, purity, and year of minting, as well as the “OM” mint mark from the Mexican Mint. The reverse of the coin offers a trip through the nation’s historical emblems. Mexico’s coat of arms consists of a bald eagle battling a serpent from its perch atop a cactus. The modern-day coat of arms is featured in the center, with 10 historic versions of the emblem featured around the outside. 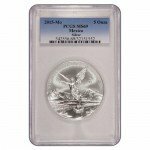 With a purchase of the 2015 1 oz Mexican Silver Libertad coin through this product listing, you are investing in 450 coins with a total weight of 450 oz of .999 pure silver. Your Monster Bag consists of tubes of individual coins packaged in groups of 25. If you have any questions about this product or the Monster Bag packaging, feel free to contact a Silver.com associate at 888-989-7223. You can also reach our team members through our live web chat and via email. If you are looking for similar products, be sure to check out our full selection of Mexican Silver Libertads.